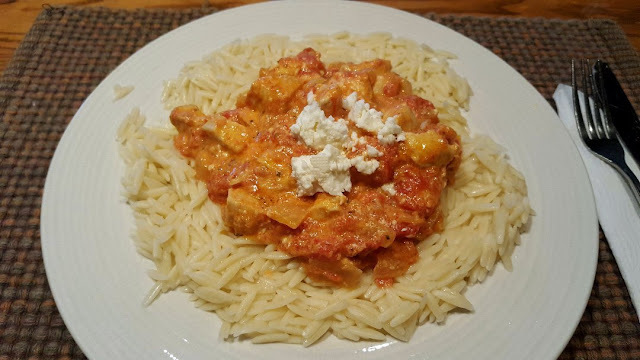 Rain's Garden: Greek Chicken and A Wee Bit of Sunshine! I made a very easy dinner last night, Greek Chicken on Orzo. The preparation took longer than the actual cooking time! I was feeling really restless mentally...I hate being in bed all day, even if it's recovering from an injury! I get so bored...but I was good - I let Alex do most of everything for me, I napped, cuddled with the pets, relaxed and watched British comedies. But by 6 pm, I wanted to be in the kitchen! This dinner didn't take much energy thankfully and it was delicious! 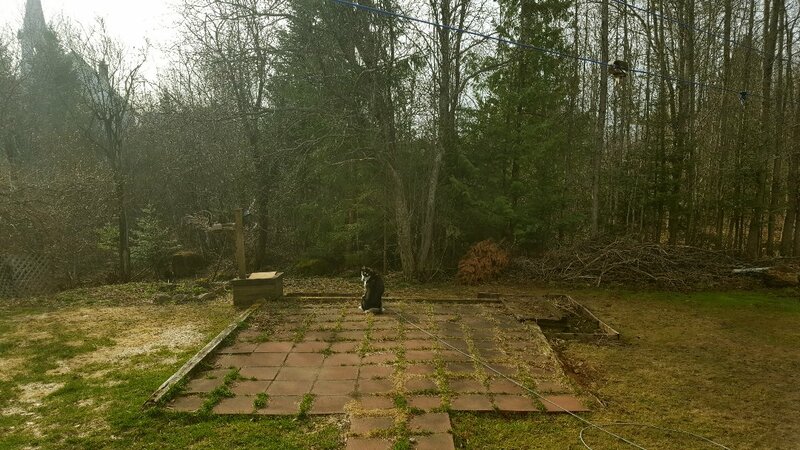 I let the dogs out in the yard this morning, debating on whether I could manage a walk in the woods. Charlie gave me such a guilt trip that I had no choice! 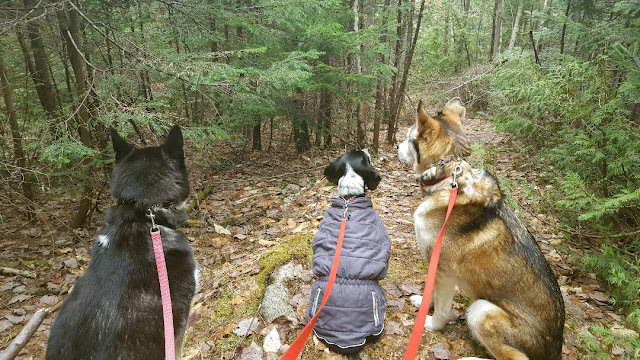 So into the woods we went! :) Actually I am feeling a lot better. I'm taking much better care of myself lately. The Arnica gel is working wonders for pain and bruising. I've been treating my swollen digits and joints with ice and taking Tylenol for pain. Normally I'd just grin and bear it but I'm just way too restless and anxious busy for that! :) It's still very chilly out though, we had frost on the ground this morning and there are still pockets of snow in the woods. The dogs really enjoyed their walk, though we went a little slower today! They were on the scent of something...the woman who owns the gas station in town told me she saw a lynx cub in her backyard. As soon as her dogs spotted it, it ran away, but I'm still keeping an eye around and up in the trees to be safe. When we got back from the walk, I felt it. I was and am quite sore. Despite the pain, my mood skyrocketed when the sun came out! :) It's been too long, sadly, it won't last though, there is rain in the forecast for another 5 days. I'm always hoping the forecast changes! My plants are loving this sunshine! 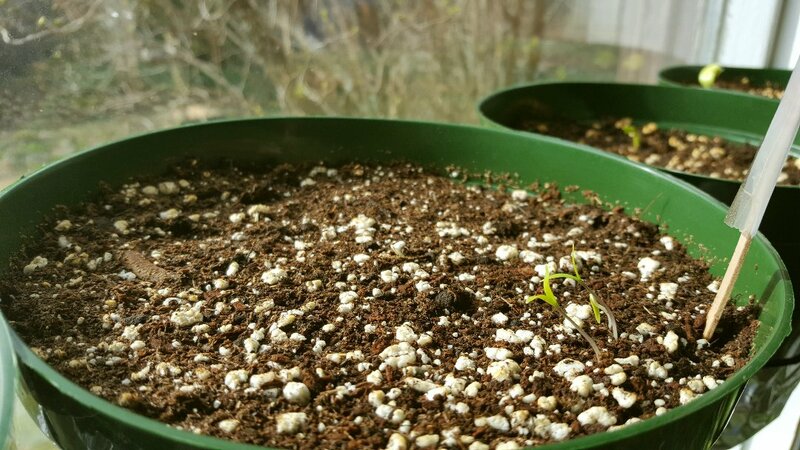 Yesterday I reported that the only holdouts in my window garden were the spring onions and Roma tomatoes...well, the Romas are coming up! These are the seeds that I found in the basement, so clearly they are still good! The onions though, they are still playing hide and seek. Can't wait to see the difference between the indoor and outdoor pumpkins. The sun is tryìng to come out here too. It was suppose to go up to 17 c ... now it changed to only 7c. Bummer. You know, I have never had orzo! It looks delicious tho - I may just have to put that recipe on my radar. Its hard for me to sit and heal/do nothing so I completely understand! I am one of those who does not sit until its time for bed. So add an injury in there and I would get cranky! Arnica is a wonder isn't it? But I would be more than happy to watch British anything :) that would make my day! Look at your little beauties all popping up! They are loving that sunny shelving unit! :) Pumpkins are the 1 thing I grow every year but I never had luck with starting from seed - they would always die once hardened off. So I quite happily buy from the garden centre. One year I grew one that weighed in excess of 80 pounds! I was so happy with it but worried that someone would steal it close to Halloween. Luckily it stayed firmly on the vine until it was time to carve it! That was a good growing year! Last year I grew warty ones.....got 2 nice sized ones that sat on the stairs and greeted the trick or treaters! Halloween is a year round holiday in my house. We are having some nice temperatures but that wind still has a bit of bite to it. If you are in the sun and sheltered its lovely, but you will get reminded quickly that it can snap you in half if it wants once you are out of the sun! I hope your pain is easing and that you are able to move freely a bit better. I LOVE Orzo! I really like little thin pasta and orzo makes the cut for me. Because I can't eat rice, I even use orzo to make my faux-risottos. It's a lovely little pasta! Good for salads too. The arnica is SO GOOD...I wish I tried it sooner! Honestly, I couldn't handle your wind...that's one reason why I left P.E.I. I couldn't handle that constant wind. I guess you get used to it but I never did! Wow an 80 pound pumpkin??? I'm SO IMPRESSED!!! I want to grow giant pumpkins but not where I live here! Halloween is a year round holiday here too :) I'm waiting to see because even the seed package said to start the pumpkin seeds indoors. We'll have to wait and see though! I want at least one or two pumpkins to carve for Hallow's Eve :) That's my goal this year! We are getting floods of rain. I just hope it's not a repeat of the flooding we had 2 years ago. Glad you are able to get outside. I think what it is with pumpkin plants is that the roots don't like to be disturbed. So if you carefully plant your whole pot of three or so started seeds you should be okay. You could always thin them down once you have them established in the ground. I usually plant 5 seeds to each mounded up hill, and then thin to the 2 strongest ones when I'm sure they're all going to make it. I've never tried orzo either! That chicken dish looks delicious. It's so much fun to have a small vegetable garden. Hi Kristina :) Oh my, stay safe! We don't have flooding problems here thankfully. I took advantage of the day yesterday but we are back to rain until Tuesday now. I watched a video on hilling up the pumpkin seeds, just like you said to do so I'm going to try that with my leftover seeds. I'd be happy if both methods work. I have to be really careful transplanting them, I'm so looking forward to it, the seedlings are all doing great! Hi Dawn! :) So we've both got pumpkin-fingers-crossed!! I hope yours are successful too! I'm looking forward to reading about that on your blog. Hi Nancy :) Well, I think that with 3 dogs and my really annoyingly loud air horn, the lynx would just run away. I'd be more nervous if I were out in the woods alone! Yes, getting out and about is good for you even if it hurts! LOL! With 'old age' upon me I know if I don't use it I'll lose it so I move whether it hurts or not and before long I'm fine. I cannot lay around too long except my legs do tire so I take breaks but I knit or crochet as it seems I always have to be productive. The Greek chicken looks amazing and sounds really tasty. 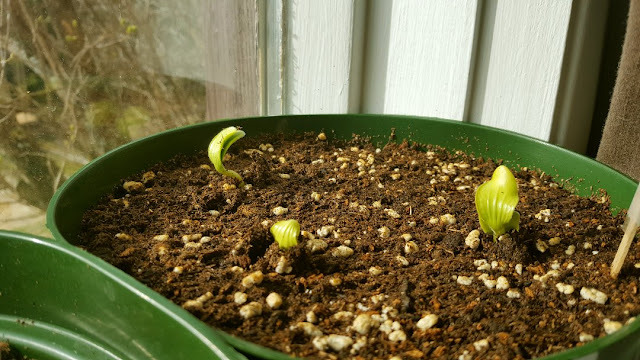 Look at your seedlings go!